Die St. Mary's Original Jamaican Banana Chips sind, ähnlich wie die Chippie's Banana Chips, ein würziger Knabberspaß für zwischendurch. Sie werden hergestellt aus fritierten Grünen Bananen und sind leicht gesalzen. 0 (null) Gramm Transfette! St. Mary's Original Jamaican Banana Chips are made with freshly reaped Caribbean bananas, blessed by the Caribbean Sea and sun and inspired by passion for great food. 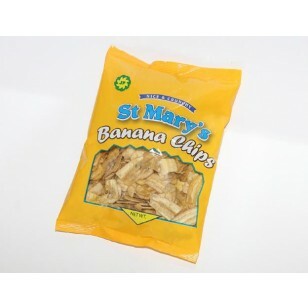 St. Mary's Banana Chips are finely sliced, freshly made and crunchy. The unique recipe originates from the Jamaican parish of St. Mary. All natural. Enjoy!